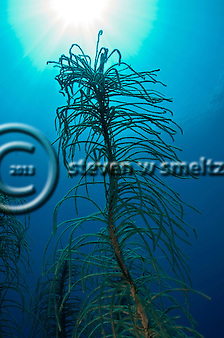 Our underwater world consists of a wide variety plants and animals. Some of the most important animals are those that make up our reef system. These Coral reefs are made up of millions of tiny animals which belong to the class anthozoans. The largest class of organisms within this phylum are the cnidaria (the “c” is silent). Cnidaria has over 6,000 known species including sea fans, sea pansies, jellyfish, and sea anemones. Corals, after their larvae stage, are are no longer mobile but rather stay fixed in one place. This type of animal is called a sessile animal. Coral reef colonies are composed of many tiny, cup-shaped animals called polyps, which are related to jellyfish. A single coral polyp may be as large as a saucer or smaller than the head of a pin. Millions of polyps working together in a cooperative colony generation after generation creating the limestone skeletons that form the framework of our beautiful coral reefs and a critical component of life in the underwater world. Corals begin life in tropical waters as free-floating larvae. After a relatively short period of time, the larva attaches itself to a hard surface and becomes a polyp. Polyps divide asexually and form colonies. Coral colonies reproduce both sexually and asexually. In sexual reproduction, the coral polyps release both eggs and sperm into the water. (This is also known as coral spawning.) One type of asexual reproduction occurs when fragments of coral are broken off as a result of storm action. The broken pieces of corals usually survive and continue to grow and produce a new colony. This process is referred to as “fragmentation”. it provides protection, as the polyps can contract into the structure if predators approach and second this same skeletal structure is what builds up the coral reefs over time. The calcium carbonate is secreted at the base of the polyps, so the living portion of the coral colony occurs at the surface of the skeletal structure, completely covering it. The calcium carbonate deposited by the living colony continually adds to the size of the overall structure and thus the growth of the reef. The growth of these reef structures varies greatly, depending on the species of coral and environmental conditions– ranging from 0.3 to 10 centimeters per year. 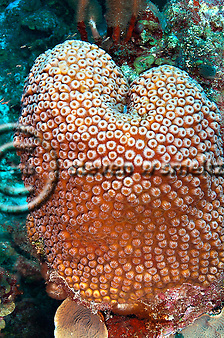 The skeletons of stony corals are secreted by the lower portion of the polyp. This process produces a cup, called the calice, in which the polyp sits. The walls surrounding the cup are called the theca, and the floor is called the basal plate. Thin, calcareous septa (sclerosepta) extend upward from the basal plate and radiate inward from its outer wall. This provides structural integrity, protection, and an increased surface area for the polyp’s soft tissues . Periodically, a polyp will lift off its base and secrete a new floor to its cup, forming a new basal plate above the old one. This creates a minute chamber in the skeleton. When polyps are physically stressed or under potential attack, they contract into the calice so that virtually no part is exposed above the skeletal platform. This protects the organism from predators and the elements (Barnes, R.D., 1987; Sumich, 1996). In the underwater world, different species of coral build structures of various sizes and shapes such as brain corals, fan corals, encrusting corals, etc., creating amazing diversity and complexity in the coral reef ecosystem. Various coral species tend to be segregated into characteristic zones on a reef, separated out by competition with other species and by environmental conditions. Corals have only a limited degree of organ development and consists of three basic tissue layers. They have an outer layer or epidermis, an inner layer of cells lining the gastrovascular cavity (an internal space for digestion) and a layer called the mesoglea in between the other two layers Barnes, R.D., 1987. Corals feed by reaching out with tentacles to catch prey such as small fish and planktonic animals (any drifting organisms, animal, plant, archaea or bacteria that inhabit the pelagic zone of the oceans).